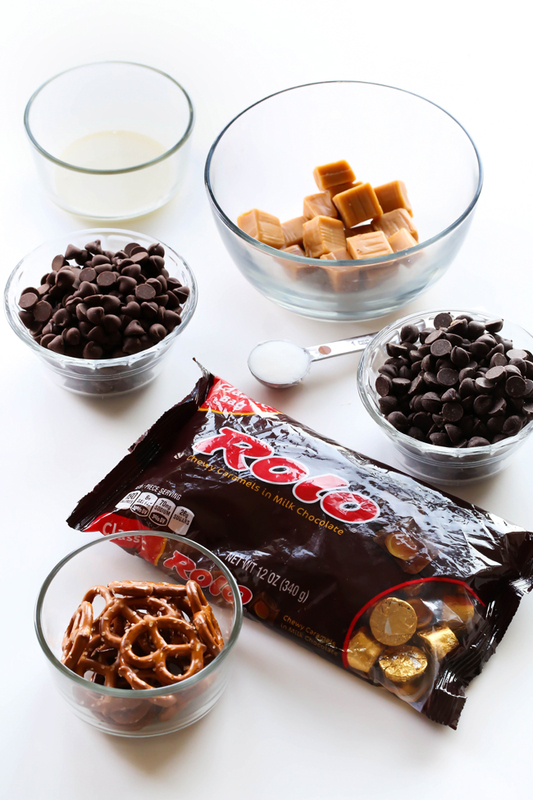 An extremely simple yet tasty chocolate-caramel treat using ROLOS that only takes a few minutes to put together and tastes absolutely incredible! It is the perfect combo of sweet and salty! Bark is one of the easiest and tastiest treats this time of year! I am so excited to be partnering with HERSHEY’S today to bring you this yummy recipe! 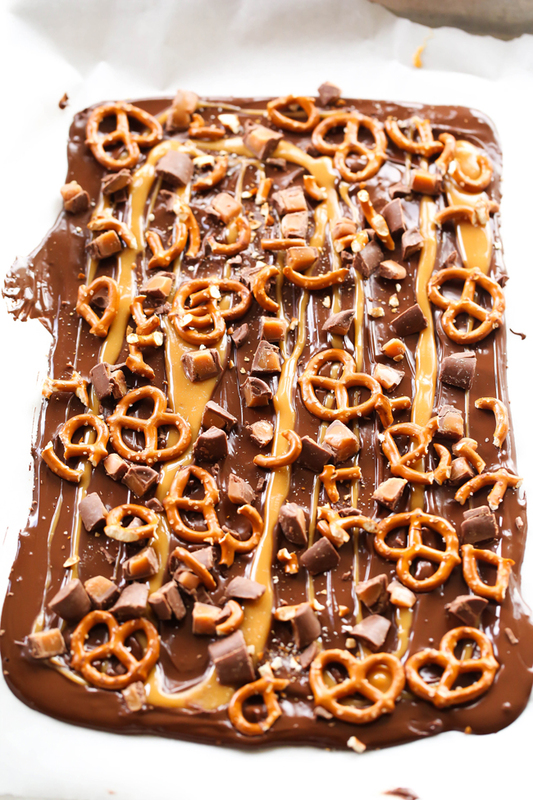 It encompasses a lot of my favorite things… ROLOS, Pretzels, chocolate and caramel. 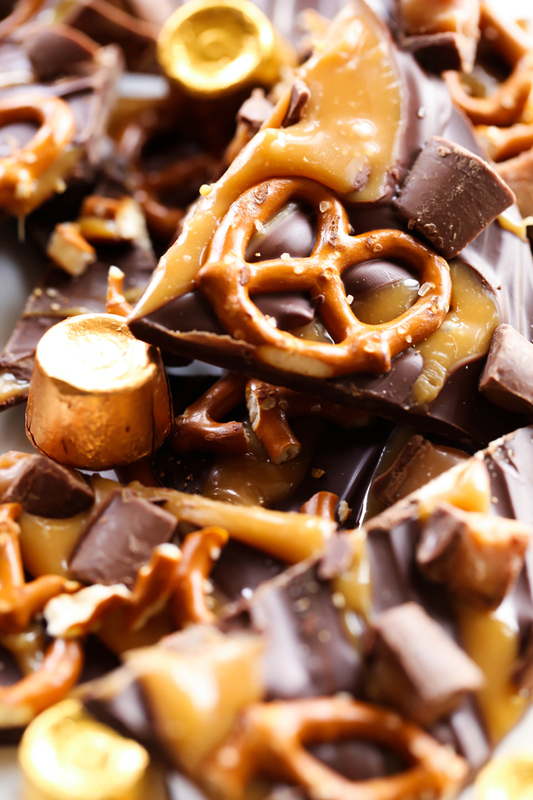 It is a delicious blend of sweet and salty flavors and a wonderful blend of textures with chewy caramel and crunchy pretzels. You should totally put this on your holiday baking list! It comes together super quick and tastes amazing! 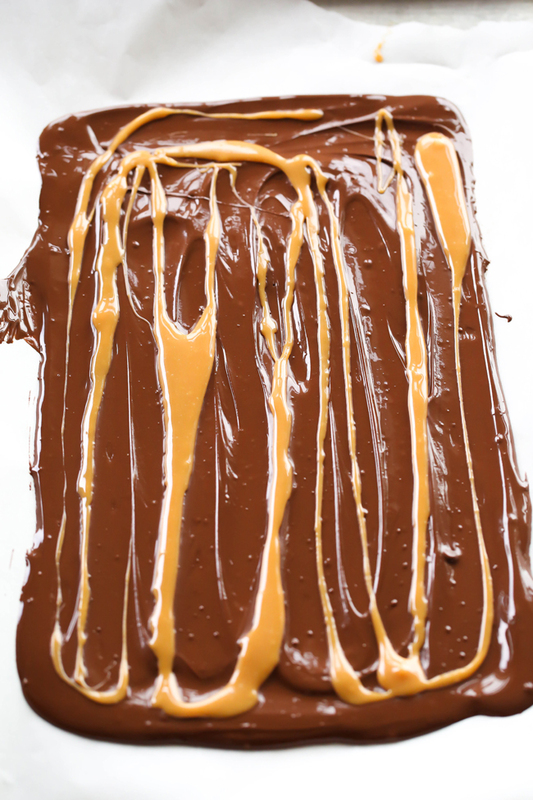 And lastly you are going to drizzle on more caramel. This bark seriously takes minutes to make and once its set up you are ready to score and break apart. These make FABULOUS neighbor gifts! I took this recipe to a family party this past week and people kept coming back for more! An extremely simple yet tasty chocolate-caramel treat that only takes a few minutes to put together tastes absolutely incredible! It is the perfect combo of sweet and salty! In a large microwave safe bowl, combine HERSHEY’S Semi-Sweet Chocolate Chips, HERSHEY’S Milk Chocolate Chips and shortening. Microwave in 30 second increments, stirring between each increment until melted and smooth. 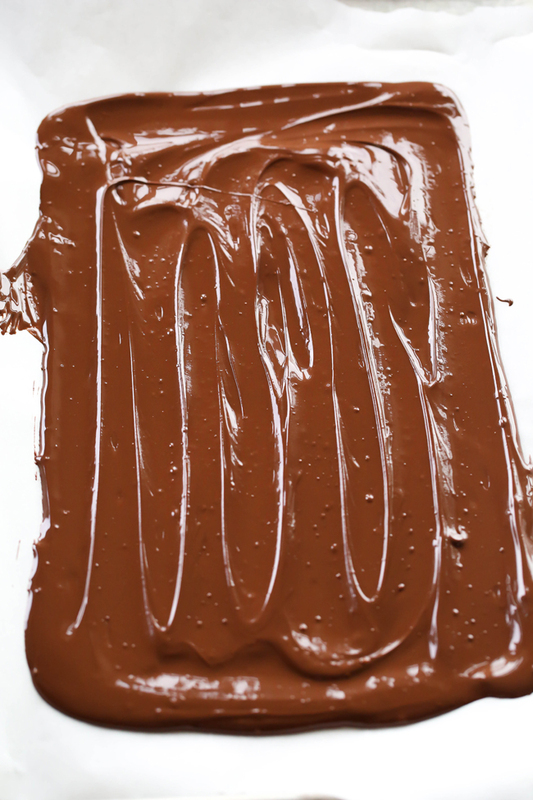 Spread melted chocolate into a rectangular shape over parchment paper. In a small microwave safe bowl, combine 8 soft caramels with 1 ½ teaspoons heavy cream. Microwave in 30 second increments, stirring between each increment until smooth and completely melted. 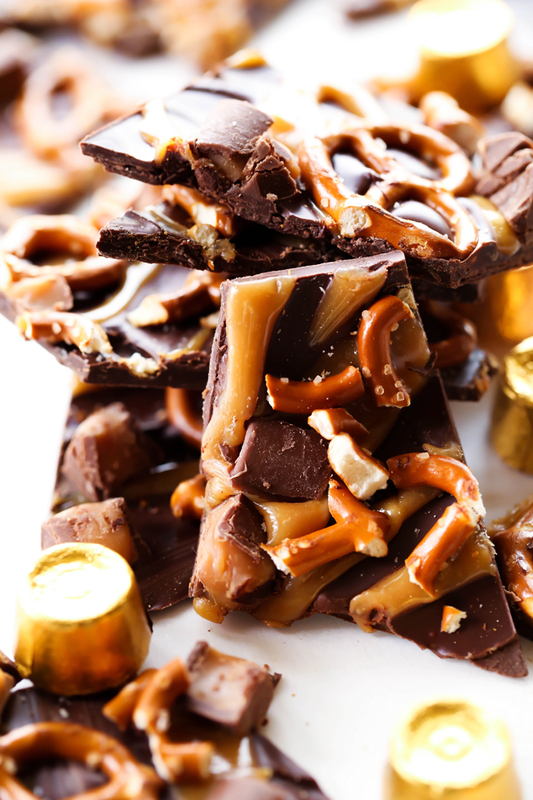 Drizzle melted caramel over the chocolate. 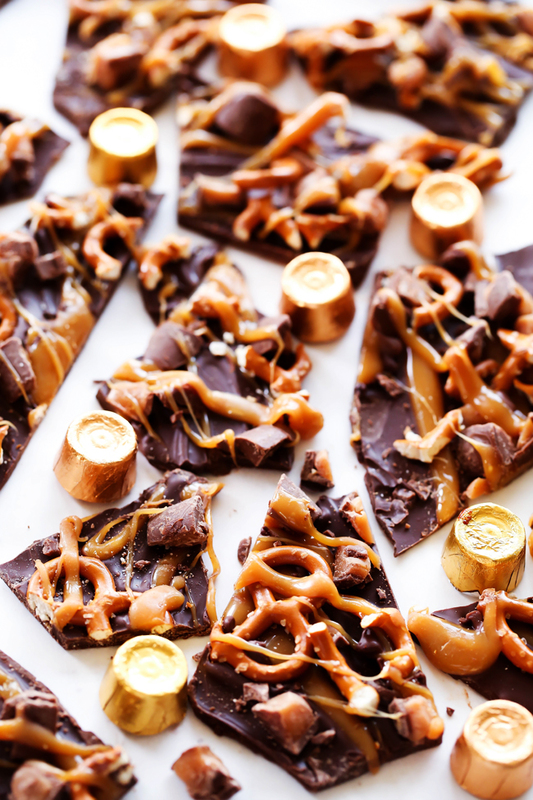 Sprinkle chopped ROLOS evenly over the chocolate-caramel bark. Place pretzel twists over the top of the bark, breaking in pieces as needed. In a small microwave safe bowl, combine remaining 8 soft caramels with remaining 1 ½ teaspoons heavy cream. Microwave in 30 second increments, stirring between each increment until smooth and completely melted. Place in freezer for 15 minutes. After 15 minutes score bark with a knife. Place back in freezer until completely set. Break bark into pieces, using your score marks. This post was sponsored by HERSHEY’S. Thank you so much for supporting our sponsors. All opinions expressed are my own. This is so fabulous! Holy schnikes, I will be making this today. I'm pretty sure I have all the ingredients already, and my coworkers will be thrilled tomorrow at our holiday party! 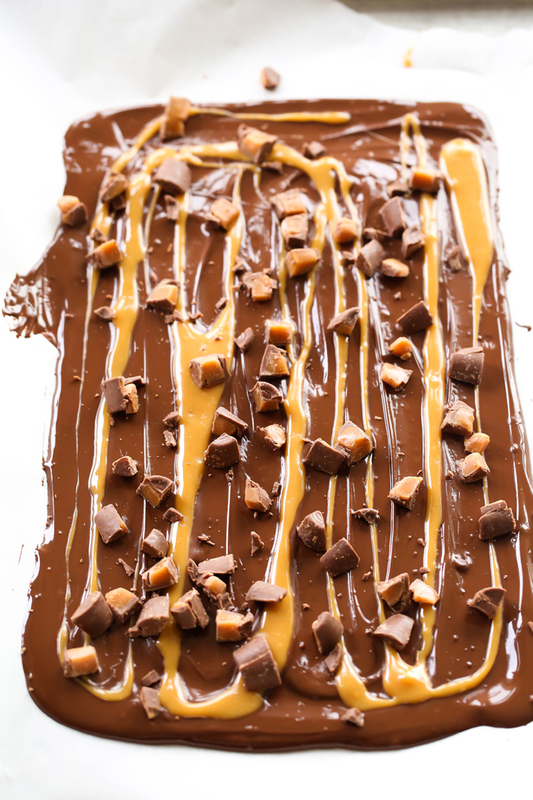 I think I would do the regular chocolate part, but then add almond bark (candy chocolate) as a drizzle on top. My pretzels and my cut up Snickers (instead of Rolos) didn't stay on the bark.